Ettumanoor Mahadeva Temple is one of the most famous Lord Shiva Temples in Kerala. The ten-day annual festival held in the Malayalam Kumbham month is famous for the display of the ezharaponnana (seven and a half gold elephants) - this is on February 14, 2019. In 2019, Ettumanoor Mahadeva Temple Festival is from February 7. The Arattu will be held on February 16. 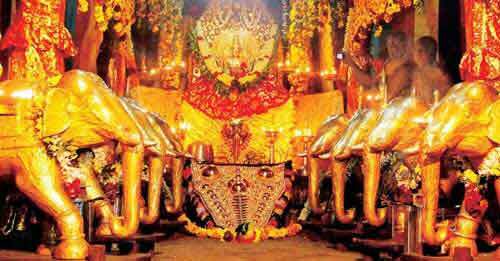 The ezharaponnana (seven and a half gold elephants) display takes place on the eighth day of the Ettumanoor Temple festival. These elephants were gifted to the Shiva Temple in 1759 AD by the then ruler Karthika Thirunal Maharaja of the erstwhile Travancore Kingdom. Actually there are eight elephants but it is known as seven and a half gold elephants because seven elephants are two feet high and the last one is one foot high. Ettumanoor Shiva Temple Arattu is held on the night of the tenth day of the festival. Ten caparisoned elephants accompany the Murti or idol of Lord Shiva in a procession to a pond nearby for Arattu (holy bath). During the ten days of the festival, various performing arts and temple rituals are staged in the temple premises. Kathakali and Velakali attract enthusiasts from all places in Kerala. Ettumanoor Mahadeva Temple is located around 12 km from Kottayam Town.